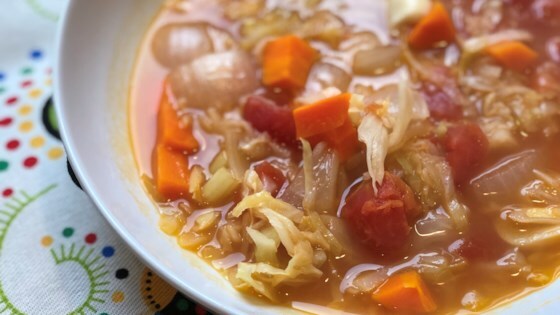 "This simple vegan cabbage soup is perfect for a detox diet. It's a tasty no-fuss recipe that takes 30 minutes to make in your Instant Pot®." Combine cabbage, vegetable broth, diced tomatoes, carrots, celery, onion, garlic, apple cider vinegar, lemon juice, and sage in a multi-functional pressure cooker (such as Instant Pot(R)). Close and lock the lid. Select high pressure according to manufacturer's instructions; set timer for 15 minutes. Allow 10 to 15 minutes for pressure to build. Release pressure using the natural-release method according to manufacturer's instructions, 10 to 40 minutes. Unlock and remove lid. With thanks to Tome Trajkovski for the paprika rue, I can give this 5 stars! Thank you, Tome!